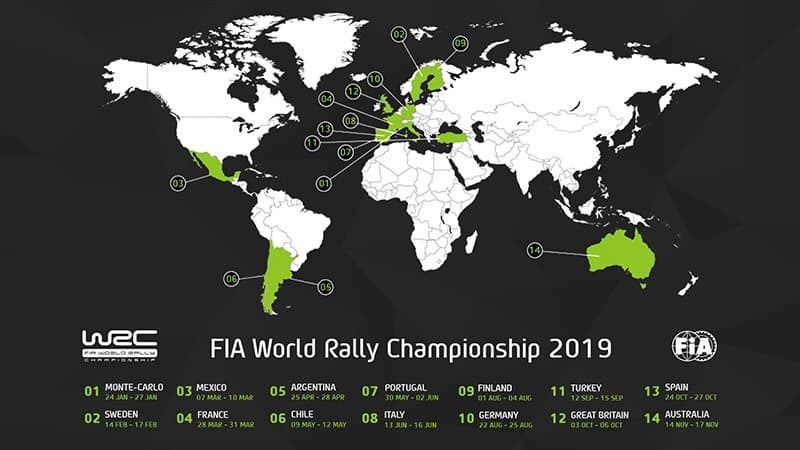 The proposed calendar of 2019 FIA World Rally Championship was published today at the World Motor Sport Council at Paris . Fourteen rounds have been selected, including the gravel event in Chile, which is the first new country since Bulgaria in 2010 and the 32nd country in the history of the series. Otherwise the calendar remains basically unchanged. Returns for a WRC event for Japan and Kenya did not eventuate for 2019. Efforts to bring the WRC to the continents of Asia and Africa have not succeeded, however a candidate rally will run next season with a view to proposing a return in 2020. Chile is now to be a second event in South America. There will be a six week mid-summer break in late June and all July, while Australia remains the final event in the series. Portugal is two weeks later than this year, Italy, Finland and Germany one week later. Chile is scheduled for two weeks after Argentina. Fourteen rounds was widely agreed between the teams to be the absolute maximum number of events they could handle in a season.